In partnership with the University for Seniors at AUB and after the success of last year's Introduction of Social Media course for seniors (and the impressive mention on Mashable), we would like to announce that we will be offering two new courses for the elderly this coming fall. This is a basic introductory course to computers and technology for people who do not have any knowledge about operating a computer. Course material will cover an introduction to personal computing, hardware, software, operating system tools and Windows applications, word processing, web browsing and email. This is a more advanced course for people who want to learn about social media and social networking sites. The material will emphasize the proper usage of social media and a discussion on the importance and drawbacks of such tools on society. The course will cover a basic introduction of how society is utilizing social media, using Facebook and Twitter, searching for and creating blogs and a brief overview of other emerging social networks. Prerequisites: CMPL 001 or basic computer literacy. To register yourself, your parent or grandparent for either courses, kindly send us an email at aub@onlinecollaborative.org. Minimum age of students: 50 years old. 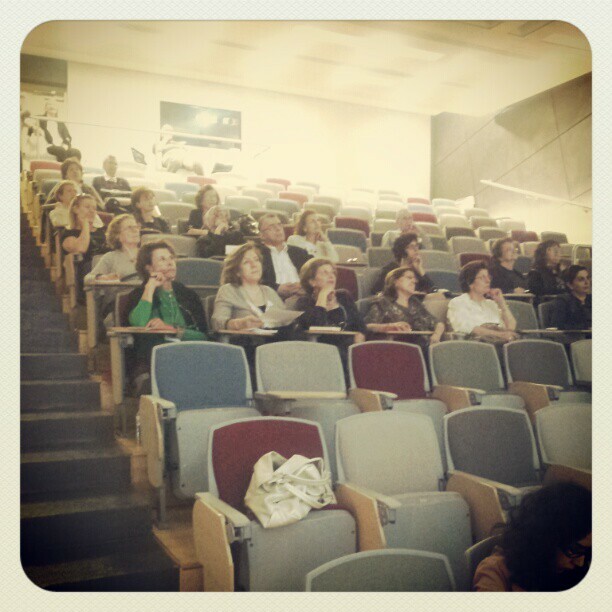 Photo from the introductory session of CMPL 002 from Spring 2012. AUB's Online Collaborative is a student organization at the American University of Beirut that operates under the general bylaws and guidelines of the AUB institution, the Online Collaborative NGO and general Lebanese laws. The views and opinions expressed on this blog may not reflect the views and opinions of the American University of Beirut or even the entity of Online Collaborative as a whole.